For the Egyptians pursue a philosophy of their own. This is principally shown by their sacred ceremonial. For first advances the Singer, bearing some one of the symbols of music. For they say that he must learn two of the books of Hermes, the one of which contains the hymns of the gods, the second the regulations for the king's life. And after the Singer advances the Astrologer, with a horologe in his hand, and a palm, the symbols of astrology. He must have the astrological books of Hermes, which are four in number, always in his mouth. Of these, one is about the order of the fixed stars that are visible, and another about the conjunctions and luminous appearances of the sun and moon; and the rest respecting their risings. Next in order advances the sacred Scribe, with wings on his head, and in his hand a book and rule, in which were writing ink and the reed, with which they write. And he must be acquainted with what are called hieroglyphics, and know about cosmography and geography, the position of the sun and moon, and about the five planets; also the description of Egypt, and the chart of the Nile; and the description of the equipment of the priests and of the places consecrated to them, and about the measures and the things in use in the sacred rites. Then the Stole-keeper follows those previously mentioned, with the cubit of justice and the cup for libations. He is acquainted with all points called Paedeutic (relating to training) and Moschophatic (sacrificial). 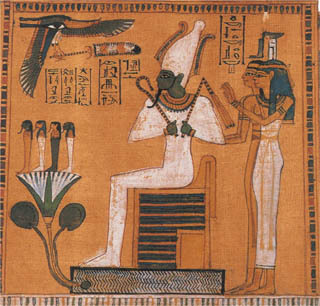 There are also ten books which relate to the honour paid by them to their gods, and containing the Egyptian worship; as that relating to sacrifices, first-fruits, hymns, prayers, processions, festivals, and the like. And behind all walks the Prophet, with the water-vase carried openly in his arms; who is followed by those who carry the issue of loaves. He, as being the governor of the temple, learns the ten books called "Hieratic;" and they contain all about the laws, and the gods, and the whole of the training of the priests. For the Prophet is, among the Egyptians, also over the distribution of the revenues. and the other six, which are medical, by the Pastophoroi (image-bearers), -- treating of the structure of the body, and of diseases, and instruments, and medicines, and about the eyes, and the last about women. Such are the customs of the Egyptians, to speak briefly.